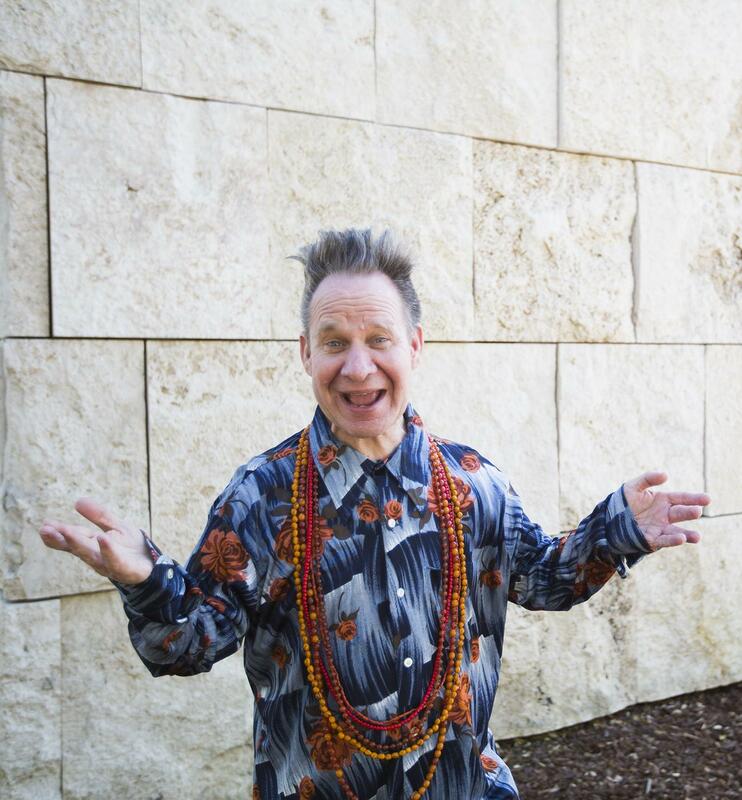 Peter Sellars has been directing theater, opera, and festivals for three decades. 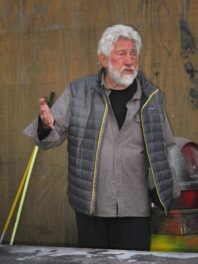 Best known for enlivening classics with contemporary themes—he once set Mozart’s The Marriage of Figaro in Trump Tower, for example—Sellars believes in the power of art to create social change. He’s currently at work on a multi-year project to bring the Vimalakīrti Sutra, a 2,000-year-old Buddhist teaching, to the stage. Sellars will discuss the project with Robert Thurman, Buddhist scholar and translator of the Vimalakīrti Sutra, at the Getty on August 10. He alighted at an outdoor table with me one Friday evening after his first visit to the Cave Temples of Dunhuang exhibition. Annelisa Stephan: How do you describe yourself? 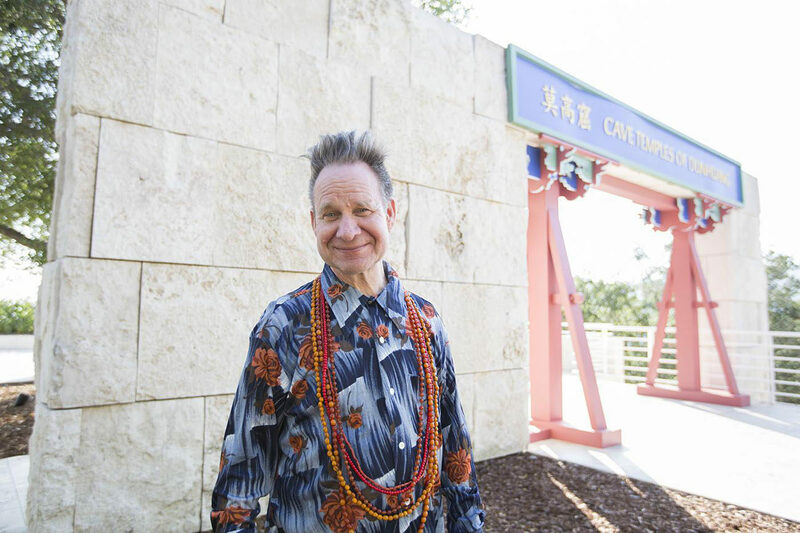 Peter Sellars: I work on collaborative, interdisciplinary, intercultural projects, which is a good way to describe the Dunhuang caves, because the caves are the first installation art. 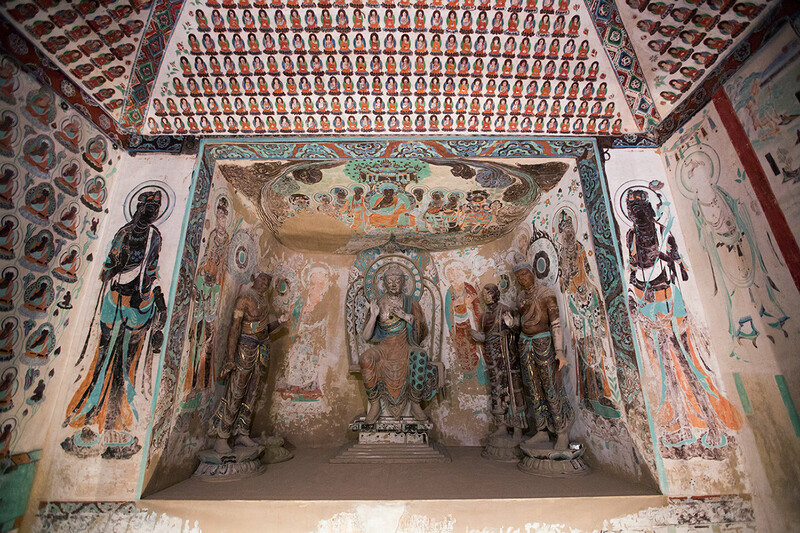 Dunhuang caves as installation art? Say more. From the immersive quality of them, [you have] the sense that the art is alive and moving around and through you and speaking to you from below, from above, and from in front, and from behind and beyond your personal orientation. These are ritual spaces that are meant to activate all the senses and all the art forms. It’s an invitation to step into a dream space. It’s the whole universe in a cave, and that cave is the cave of your heart, Plato’s cave of divine awakening. That is very exciting. There are musical instruments hovering in the sky and dancers are exploding with spiritual radiance. Each of the images is charged with sound, movement, text, and wafting clouds of fragrance. Do you feel this power in the replica caves, as well as the originals? I love the replicas. In a strange way, perhaps I prefer them to the originals in the sense that the originals are visionary and devoted acts of piety made fifteen centuries ago and the replicas are acts of piety, vision, and patience undertaken by recent graduates at the Dunhuang Academy—so I’m very moved that this ancient art form has been given new life and new breath by a contemporary young generation. And the replica caves are a lot easier to see! What is your view of the digital replicas of the caves? Many of the [original] caves have been digitally documented. Those documents are marvelous and it’s great that they exist, but they have a very different chi. The quiet concentration of an artist hand-painting a replica and translating a sublime, otherworldly experience through their own mind and body and heart and into their fingertips with courage and immediacy—what’s more beautiful than that? Whereas with the replica cave paintings, the procedure is spiritual practice. It’s not just an art project. The transformational dedication, the patience, the care, the quiet observation, the depth of feeling, the sense of the vibration of color, the miracle of a line that can transform into a holy being—all of those things are about changing your life. In the replica caves, do you also feel the presence of the artists who created the originals? Buddhism is always about the infinite present. The past and the future only exist in the present. 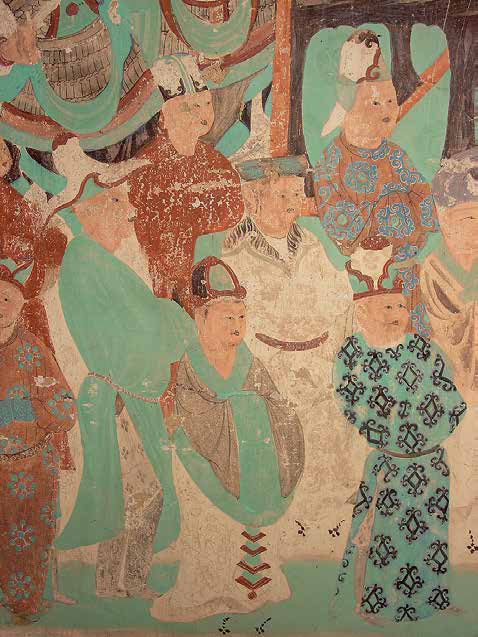 A young artist from the Beijing Academy [Central Academy of Fine Arts] who painted a panel of one of these caves last year could be a reincarnation of someone from the sixth century, and it was their karma to be reborn now and to paint this cave. Let’s talk about the Vimalakīrti Sutra, which you are working on bringing to the stage. What drew you to it? The Vimalakīrti Sutra is a very unusual sutra. Most sutras are in dialogue form, but the dialogue is more like Plato’s philosophical dialogues. The Vimalakīrti Sutra has wild comedy, amazing spectacle, and mind-blowing transformations and miracles—and everything that you think is impossible suddenly happens. I think it’s meant to be performed theatrically. Vimalakīrti is a shocker because the hero is a businessman, not a monk, who’s practicing Buddhism in ultra-miraculous ways without being in a monastery, without being a member of the spiritual elite. It’s a radical democratization of Buddhist practice. It’s taking Buddhism out of the monasteries and beyond the hierarchies and saying: No, it belongs to everyone. Every living being is a Buddha and no matter how unlikely and messed up and crazy you are, guess what? You’re also a Buddha. Vimalakīrti [offers] the sense that miracles are really what life is about. Not rational discourse, but deeply irrational, surprising, beautiful miracles. How do you bring all this to the stage? And why? You bring it to the stage with the virtuosity of performers who can astound you with what they do with their bodies– those skills carry profound moral implications– who are capable of incredible emotional insight, and who can take you very, very far from one state into another. Most of us are trapped in a certain emotional construct. What [does it] mean to free yourself from the mental and physical world that you think you are inhabiting and open yourself into a radically different set of feelings and possibilities? Or in the case of your bad emotions, your painful emotions, to actually let them go? What’s beautiful, and why theater was invented, was to let you look at your own behavior and the world that you have constructed to support that behavior and stand outside it for a moment, but also be inside it. That’s the genius of theater. The premiere of your Vimalakīrti Sutra is set for 2020. Why so far away? I want to give the piece enough time to evolve. These caves here are the work of centuries. If you just whip something up, it can disappear just as quickly. So many of these experiences we’re talking about are so fleeting—you have a moment of spiritual revelation and five minutes later you’ve lost it, and ten minutes later you’re depressed again. 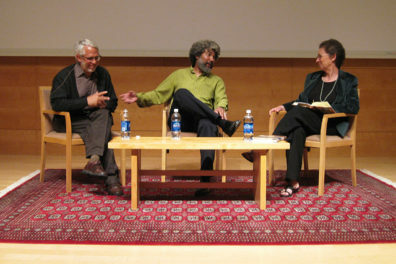 What does it mean to sustain a moment of spiritual inspiration? That’s called spiritual practice. That’s what we do in theater. That description of theater sounds very much like Buddhist practice. If someone were interested in reading the Vimalakīrti Sutra, what translation would you recommend? The translation by our guest [appearing at the Getty on August 10] Robert Thurman. Bob made this beautiful translation as a graduate student. It’s one of his first contributions to Buddhist literature. It’s an exhilarating translation because you get the young Bob Thurman—a mind that’s teeming with ideas and that has a thrilling sense of humor, a sense of irreverence, a sense of a radical possibility. The footnotes alone are just a trip. It’s really one of my favorite texts ever and I give it to a lot of people. Your and Bob Thurman’s talk at the Getty is titled “Hidden Illumination in Dark Times and the Secret Ambrosia of Great Compassion.” I’d like to know: is there a secret ambrosia of compassion? You recognize that every day you’re in the presence of more miracles than you can count. Like compassion itself. It’s actually permeating the air you breathe. I love to think of ambrosia, because you can’t see it but you can feel it. [It’s a] beautiful aroma that deeply relaxes the body and the mind and takes you to a calmer, more beautiful, more generous, less physically tense space. Some of the most compassionate people are the most shy, the least willing to put themselves forward, so you don’t know where this generous, beautiful ambrosia is being generated, but it’s there. I also love this image of secret illumination and the sense that in darkness things are also moving. There’s a quiet joy that’s unfurling itself in the dark. Do you feel that we’re living in dark times? Yeah. I think we’re in a very intense time where the utopian ideals that created the American project are being trashed pretty thoroughly by just about everyone. We’re living through such widespread cynicism and such open, shameless corruption and grotesque injustice. The systems have completely broken down, the built-in unfairness is even bragged about. That is not creating good karma. On the other hand, during the worst times a lot of the best art is made. Why does great art come from darkness? Because people need it. People need to be reminded. [Art] becomes valuable, because you can’t look around and see things that resonate with your own deepest convictions. In fact, you look around and you see things that hurt you because they disrespect everything you care about. Art reminds you that things you care about actually exist and also reminds you that where we are now is not where we will necessarily, eventually be. My last question is this: is there a topic that no one ever asks you about, but you wish they did? 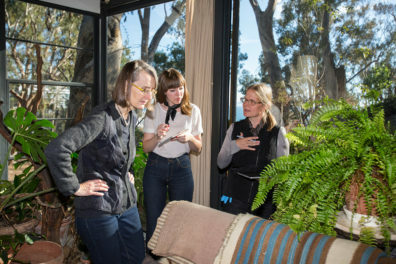 As John Cage used to say, since everything in the world is connected, anything we happen to come across is to the point. Nothing is ever left out.